Scientists have found a switch that flicks cancer cells into a Peter Pan mode where they never grow old and can live forever. The discovery could lead to new treatments to restore mortality to many common cancers. All normal cells eventually stop dividing when they reach a certain age as part of a natural process to keep the number of cells in our body in balance. 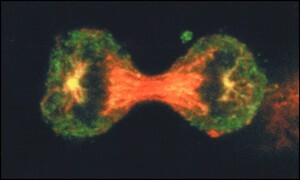 But cancer cells refuse to grow- up and continue to divide indefinitely. Experts know that a molecule called telomerase, which is switched off in normal cells, is one of the secrets behind cancer's eternal youth. Now for the first time researchers have uncovered a key step that lets cancer cells re-activate the molecule. Lead researcher Professor Robert Newbold, from Brunel University in Uxbridge, said: "Telomerase is crucial in allowing our cells to keep on dividing. "By the time a baby is born the body has shut down the production of telomerase. "From then on a strict limit is placed on the number of times our cells can divide. "But around 85% of cancers re-activate the molecule allowing their cells to divide over and over without succumbing to normal ageing and death." Scientists from Brunel collaborated with researchers from the Swiss Cancer Research Institute in Lausanne to look for differences in the structure of the telomerase gene in normal and cancer cells. They used molecular techniques to slice up the gene at specific points and found that it was easier to attack and could be cut into more pieces in cancer cells than in normal cells. The researchers believe that cancer cells unravel the telomerase gene to re-activate it exposing the DNA and leaving it more open to attack. Professor Newbold said: "Our results show that the telomerase gene is tightly coiled up in normal cells. "But in cancer cells it exists in a much less compact form making it more accessible. "It seems that cancer cells activate telomerase by unravelling the DNA that codes for the molecule. "Blocking this process could be an extremely effective way of stopping the rapid growth of some tumours." Professor Newbold's team had previously discovered a group of genes on chromosome three - one of the bundles of DNA that contain our genes - which could switch off telomerase. In this study they added an extra chromosome three, taken from normal cells, to breast cancer cells and again studied the structure of the telomerase gene. The researchers used the same techniques to slice up the telomerase gene and found that it was harder to attack in the cancer cells with a normal copy of chromosome three. Professor Newbold said: "When we turn telomerase off in cancer cells the gene re-coils, making it harder for us to get to the DNA and cut it up. "This suggests that the telomerase switch works by unwinding and winding up the gene that codes for the molecule. "Now we understand more fully how tumours activate telomerase we can begin to develop drugs that target this process to restore mortality to cancer cells and stop them from growing and dividing indefinitely." Professor Newbold is setting up a Europe-wide collaboration between research institutes and pharmaceutical companies to design drugs that will exploit this new discovery and stop telomerase from being activated in cancer cells. The research is published in the journal Cancer Research.